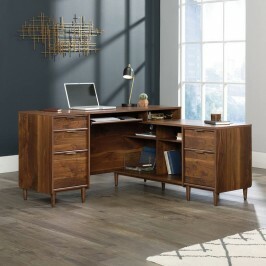 We are pleased to introduce our new range of Mid Century Style home office furniture. The mid century modern style is as popular as ever. It's inspired by the architecture, furniture and graphic design from the middle of the 20th century - roughly from the mid 1930s through to the mid 1960s - although opinions differ on this. This retro design trend is all about clean lines and gentle organic curves and embraces both natural and synthetic materials. The midcentury modern style also places an emphasis on function. So if you are creating a new home office design then it's important that you have a desk and storage units that work well for you as well as looking good, as the home office is a place to work or study first and foremost. 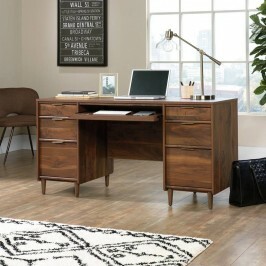 Our mid century modern office range offers both practicality and style. 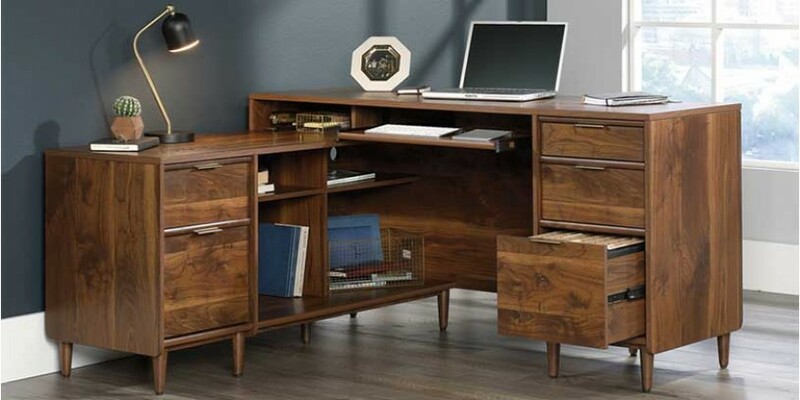 The centerpiece of our home office furniture range is the walnut executive desk. 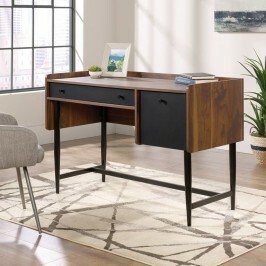 This stylish home office desk offers an ample desk space together with an additional "flip down" panel for a keyboard and mouse, as well as ports and "pass through" points for cable tidiness. The desk provides a large central draw, four side storage draws and two filing draws, all with smart brass handles. If you would prefer a corner desk then the L-shaped home office desk is perfect. 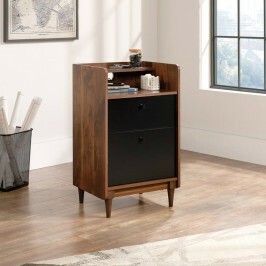 This offers even more storage and desktop space as well as being a very practical option for smaller home offices. The 360 degree all round finish also means the desk can be free standing and used to visually divide up a larger interior space. We also offer a compact home office desk in this range that is ideal for a small home office or study. 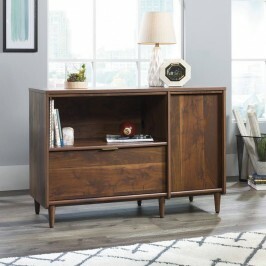 As well as the desks we also offer a walnut finish home office credenza. This home office storage unit includes a large open display shelf ideal for oversize books and ornaments, a large cupboard with adjustable shelf for different size books and folders, and a lower double filing draw. Solid wooden feet also complement the design. If your space is somewhat limited then the home office storage stand provides a filing draw, large storage draw and top display shelf. If you are looking to create a mid century modern home office interior design then our affordable Mid Century Style range is ideal. 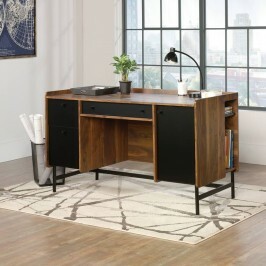 These affordable home office desks and storage units will look superb in a wide range of home office interior designs. 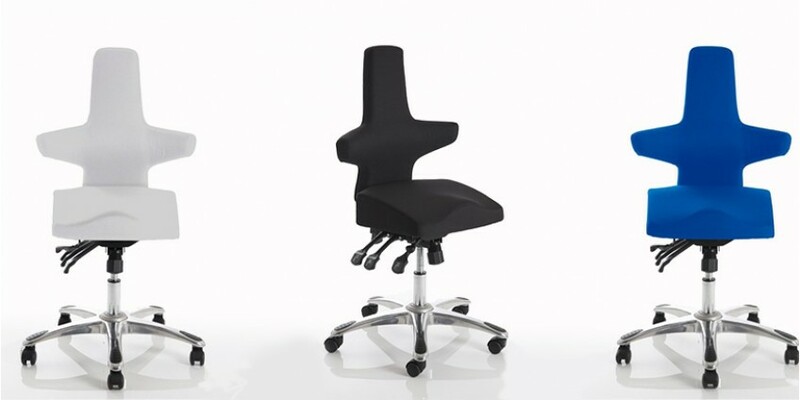 As the midcentury modern style encourages mix and match, a more traditional home office chair will also look great with these desks. Modern lighting options also work well, as do bold colours for your walls and other furnishings. Stylish accessories are also important to complete this look. 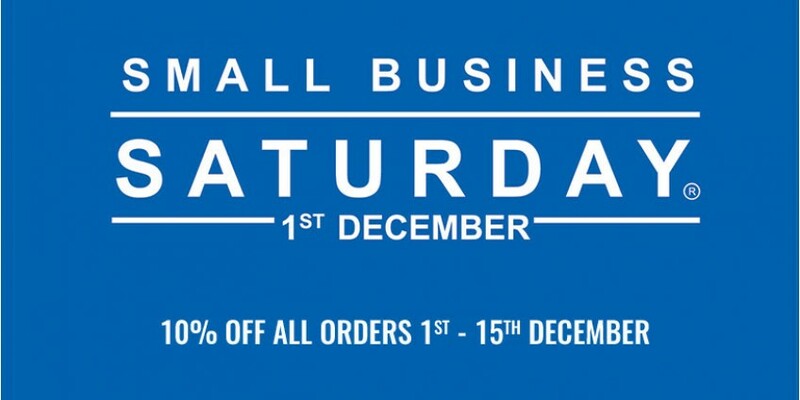 All the items in our Mid Century Style office range are available with free delivery in 2-6 working days.